Dolomite is calcium magnesium carbonate, it’s crystals are rhombohedral, with saddle-like curved faces and frequent twinin-ing. It can also form in granular or massive habits. The colour ranges through white, grey, greenish, brownish or pinkish. It forms in magnesium limestone and in hydrothermal veins. Fine deposits of Dolomite crystals have been found in Spain, Italy, India, Great Britain, Switzerland and Namibia. 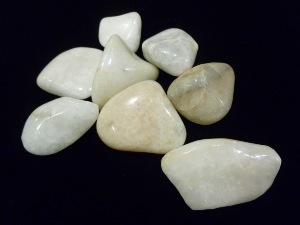 Emotionally Dolomite is believe to lend a calming, serene energy to the emotional body. Dolomite is said to stimulate the heart centre, allowing one to experience love, compassion and appreciation. Physically Dolomite is said to be excellent for physical detoxification. It may support the healing of bones and may also assist in preventing bone loss. It’s believed to balance metabolism and appetite, thus supporting natural weight management. It is said to be soothing to the nervous system and can reduce stress.